Fall in love with yourself for this is the greatest gift you can ever give yourself. Falling in love with yourself entails you building and developing yourself. It entails you working on your self-confidence. Remember, confidence is you knowing and understanding that you are worthy. You cannot fully know or understand this without you falling in love with yourself. Falling in love with yourself helps boosts your self-confidence. Remember, confidence is not pride. Many at-times, people seek for love in all the wrong places. Many a-times people seek for love in people. When the truth is that the only person that can ever love you the way you desperately want to be loved aside from Jesus, is the person in the mirror, that is YOU. Fall in love with yourself and you will notice that those vacuums you desperately needed to be filled by the love of others people is automatically being filled. 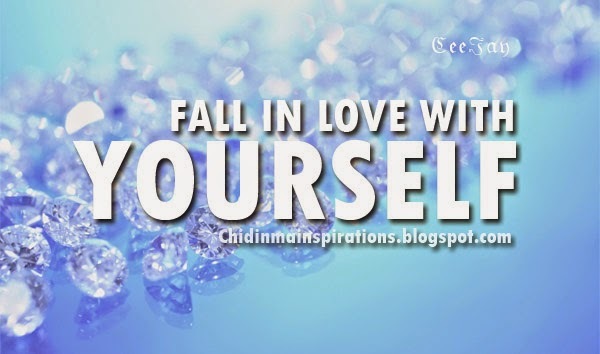 As earlier stated, falling in love with yourself entails you building and developing yourself. How can you do this? Simple. Invest in yourself. Develop and build yourself, mentally, spiritually, physically, socially, morally etc. Read books. This necessarily doesn’t have to be academic books. It could be inspirational books, motivational books, fictional books etc. Reading books helps train the mind and the brain. The more you read, the more you tend to see life from a different perspective. Books literally mean someone else’s wisdom and knowledge in print. Will it not be a good idea to learn from the wisdom of people you may never meet? It sure is a good idea, right? So, read books. P.S- The Bible does not fall under this category of books because the Bible is a book that we all ought to read daily. Fall in love with yourself and prove others wrong that you are not what they think or say you are. When you fall in love with yourself, you tend to discover things about yourself that you never really knew of. When you fall in love with yourself, you tend to discover and appreciate your strengths and weaknesses. Cos when you know what your strengths are, you work on how to effectively utilise your strengths thereby you also improving on them. When you know what your weaknesses are, no one will be able to use them against you, unless if you let them. You will also work on improving those weaknesses. All these are as a result of you falling in love with yourself. When you fall in love with yourself, will you know and understand what it is to love and be loved. Hence you will be able to appreciate those who love you and you also love them in return. Falling in love with yourself also helps you discipline your thoughts and actions. It helps you keep yourself in check. Falling in love with yourself also helps you enjoy you own company. You will tend to enjoy your ‘’me time’’ more when you fall in love with yourself. You take yourself out. Have fun. Spoil yourself and above all, falling in love with yourself makes you happier. So enjoy falling in love with yourself throughout this week and beyond. Remember, no one can love you more than you love you expect Jesus. Please be kind enough to share this post with others and please also feel free to comment below.